Trotec is proud to be a sponsor of the 10th Annual Bay Area Maker Faire, being held in San Mateo, CA on May 15-17, 2015. Mater Faire is the greatest show and tell on earth - a family-friendly festival of invention, creativity, and resourcefulness, and a celebration of the Maker movement. 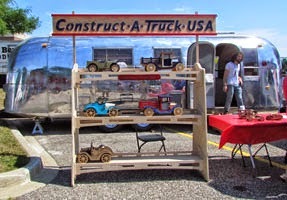 The Bay Area Maker Faire is the pinnacle stop on the Construct A Truck Road Trip, bringing trucks and lasers to various locations across the country. Trotec and Construct A Truck will be at the Maker Faire together, showing off some the exciting things Trotec lasers can do. To follow our Road Trip journey, please visit our social media forums or use the hashtag #TroTrip for up to date coverage! Trotec has limited free tickets available for the Bay Area Maker Faire. If you are interested in attending, please use the contact link below and email us your contact information and stat you would like tickets to the Maker Faire. We will mail you two tickets until our quantity runs out.